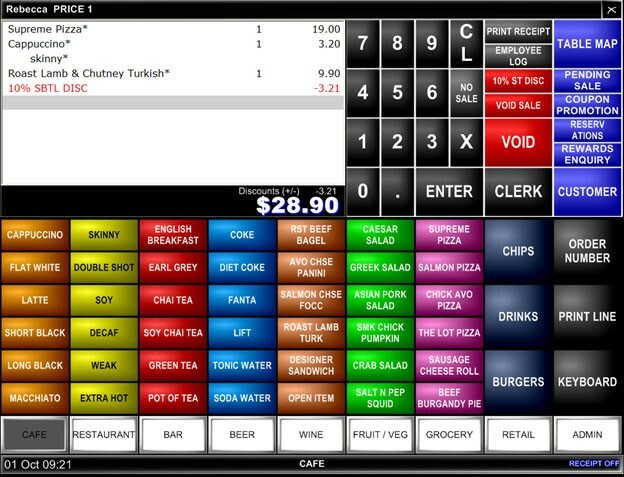 Idealpos can open automatically to the Point of Sale Window, provided the appropriate options are ticked. It is possible to turn this function off if required, for use on a back office terminal for example. Top Left – Used to display Stock Items entered, Customers, Discounts etc. Top Right – By default is programmed with numerical keypad and some admin functions. It can be customized by the User to display whatever they wish. Bottom Half – This section is used for the programming of Stock Items, Grids, Menus and admin functions. It can be customized by the User. There are nine tabs in total and they can be selected by hitting the appropriate button at the bottom of the screen. The selected tab will be darkened to show it is the tab on view. Generally you would use eight tabs for the purpose of programming and the last tab for Admin functions. Through the use of User and Clerk permissions you gain the ability to limit which of your staff can access particular tabs. The tabs can be programmed with up to 54 small buttons, 27 double height buttons, 24 double width buttons and 12 large size buttons. Underneath the tabs the current date and time will display, the Adult ID date (if selected to show), the current tab or grid that is being displayed, and the receipt settings.